Editor’s Note: June 1 is the 7th Annual Blogging for LGBT Families Day, a tradition aimed at showing support for our families in the blogosphere brought to you by Mombian.com, one of our favorite LGBT parenting blogs. Please enjoy our submission by Liz Monnin-Browder, a former GLAD attorney and co-editor of our groundbreaking new publication, Transgender Family Law: A Guide to Effective Advocacy. It was a prime example of serendipity. A few weeks ago, on the day that I saw the book TransgenderFamily Law: A Guide to Effective Advocacy in print for the first time, I received an email from a soon-to-be new dad who is a transgender man. He emailed to ask me for advice about what he should do to safeguard his parental relationship with his unborn child. As a new parent myself (my daughter is 11 months old), I was struck that this soon-to-be new dad not only needed to figure out which brand of car seat to buy and how many diapers to stock up on, but that he also needed to prepare for the arrival of his baby by retaining legal counsel and searching for resources to educate his attorney. And he is wise to do so. He is married to his wife, and they are bringing this baby into the world together as their child. But if something happened to his wife, his parentage – the fact that he is this baby’s father – could be challenged. The outcome would depend on the relevant state’s law and the judge’s familiarity with transgender people and respect for the legitimacy of their family. So he is already being a really great dad by seeking information about what to do now to protect his legal parent-child relationship with his baby, even before the baby’s birth. This is just one story that illustrates why we need Transgender Family Law: A Guide to Effective Advocacy, the first book to comprehensively address family law issues for transgender people and their families. 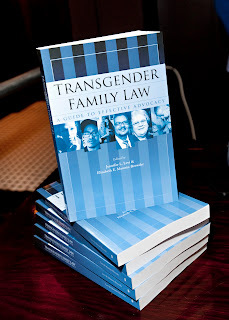 Each chapter – penned by experts from across the country – covers a different area of family law so transgender people and their attorneys can pick and choose to read the parts that apply to their situation. There are also useful sample documents in the appendix. We intended for it to be a practical, user-friendly resource. I was so grateful to have this resource to share with the soon-to-be new dad for him to provide to his attorney. Please join us in spreading the word about this book. We want as many transgender people and as many family law and estate-planning attorneys as possible to know about this resource. We want more families to be able to protect their families without ever having to go to court, and we want more families to achieve positive outcomes in the courts so that we can change the course of bad case law and make more good case law for transgender people and their families. Thanks so much for participating in Blogging for LGBT Families Day!